Karlheinz Näser founded GVA Krefeld GmbH in 1987 and his daughter Patricia Näser guided GVA’s operations since 2010. Unforseen Mrs. Patricia Näser pased away in March 2017. Mr. MBA Thorsten Stark guides GVA Krefeld as managing director at present. Since the beginning, the company focus was set on the areas of foundry products, processing machinery and plant construction. Strengths in innovative design and product development have been steadily developed making GVA to an reliable and strong partner in the market for casted products and welded constructions. Today GVA designs and manufactures cast products up to 200 tons in production facilities in Europe, Asia and America. One of the core values of GVA’s philosophy is a strict quality certification. The GVA standard requires not only ISO 9001 and ISO 14001 certificates of our production facilities, but in addition best employee qualifications, continuous development and the consistent implementation of the GVA production process. To being closer to our customers, the GVA group includes own companies in China, The United States and Europe. GVA also has a large network of business partners around the world. Since GVA’s founding in 1987 by Karlheinz Näser the core competence of GVA is the support of a wide range of industries with individually cast and forged product solutions. The services of GVA went beyond the simple delivery of a product. We support complex individual customer projects – from the idea, the design sketch, to the choice of suitable materials leading to the ready-to-install master piece. All projects and productions are guided and monitored by GVA during the complete process. GVA’s founder incorporates a vast set of knowledge within the areas of FE materials and foundry technology, which has been continuously implemented into GVA’s projects. Karlheinz Näser invented the modern slagpot with “hammock design” and “elephant feet”. GVA has developed an own quality of steel, the “GVA Special Cast Steel”. This material has a very high resilience within the harsh daily production routines, still maintaining very good welding capabilities, low tendencies for cracking and increased form stability compared to conventional carbon steels. The influences of the daughter became more and more visible in the recent history of GVA. The technical strengths of GVA were complemented by international business Know How and logistical expertise. The focus was set to financing large projects, securing of currency exchange rates, global freight and total concepts for new production methods. Even though modern IT systems and CAD workstations were implemented at an early stage, today GVA’s designers and engineers are working with 3D CAD systems to perform simulations supporting their product development and perform prototyping with 3D printers. 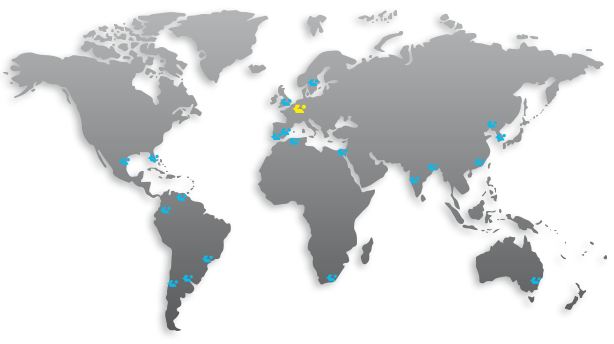 GVA Krefeld is represented by employees and partners in all key industrial segments worldwide. Our employees interact with customers and suppliers in 12 languages. The people working at GVA could not be different. Our team represents a mix of a variety of ethnic origins, different life situations, training and linguistic backgrounds. This leads to a positive area of tensions between the cultures, inspires and encourages creativity, creates solutions and calls for tolerance. Of course, every employee is a professional whose specialized skills are required on a daily basis. The education and training are essential and are an integral part of working life at GVA. GVA Krefeld GmbH is a recognized IHK training company. We offer our clients performance with added value, effective processes and long term economical solutions. This aspiration requires a continuous education and qualification of our internationally operating partners and representatives. To reach this goal we have founded GVA Acadamy in 2010. With individual coaching and advanced training we increase the extent of experience and knowledge of our workforce benefitting the customer and the customer’s application.